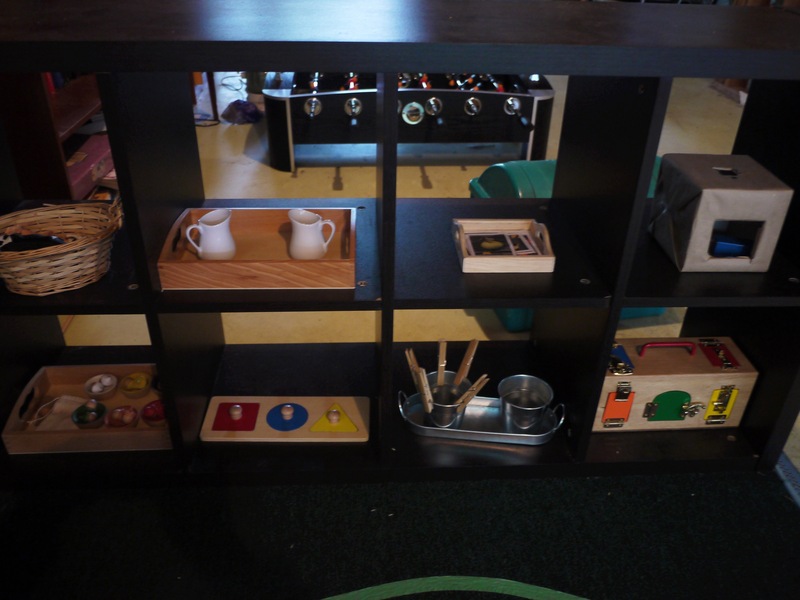 A Prepared Environment: A natural, beautiful space that is prepared with cognitive and social developmentally sequenced materials. At 15 months he’s walking (sort of) and going through an intense Sensitive Period for vocabulary. With this in mind, I have put some new activities on Quentin’s shelves. From top left: A basket of animals featured here. Next, a Practical Life dry pouring work. This is his second dry pouring activity and he is really refining his coordination of the wrist. His pouring has gotten much better. Next, his Fruit &Veg nomenclature cards featured here. I’ve put 3 pairs in the tray: apple, banana, carrot. He recognizes each picture, but doesn’t always match the carrot correctly. Last on the top is a DIY imbucare box with a rectangle block. I’ve just switched out the round cylinder box he had there before. Sometimes he forgets that you have to turn the rectangle to fit the sides properly, but mostly he gets it. This won’t engage him much longer. From bottom left: A tray of wooden painted acorns for colour matching. Quentin actually prefers to use this as a touch sensorial material. Over and over he picks up as many acorns as he can in one little fist and then carefully puts them back in the tray (not matched to the proper colour). Next a shape puzzle. He can now take out all the shapes and put them back correctly. Next, a DIY clothes pin pincer grasp activity. He mostly still pulls the pins straight off without the ability to “pinch” them open. However, I continue to demonstrate the correct way and leave it at that. Lastly a lock box. Thanks to Rachel for her insight on this amazing material. He can now work most of the bigger locks. Although it is too heavy for him to carry, he still drags it out and uses it everyday. I finally decided on this work mat from Montessori Services. It works well for Quentin as it is not too heavy. It’s amazing to see that after months of me modelling it, Quentin now stands up, picks up whatever he has been working on and tries to put it back on the shelves. A “Keeping it Real” moment: he usually drops it halfway there. But he’s trying to do it. I have never given him a “Lesson” (demonstration). I just slowly, silently, pick up the material with both hands and slowly carry it back to the spot where it was on the shelf. Although I have seen it many times before with many different children, the Absorbent Mind is truly a humbling and awe inspiring thing to witness. 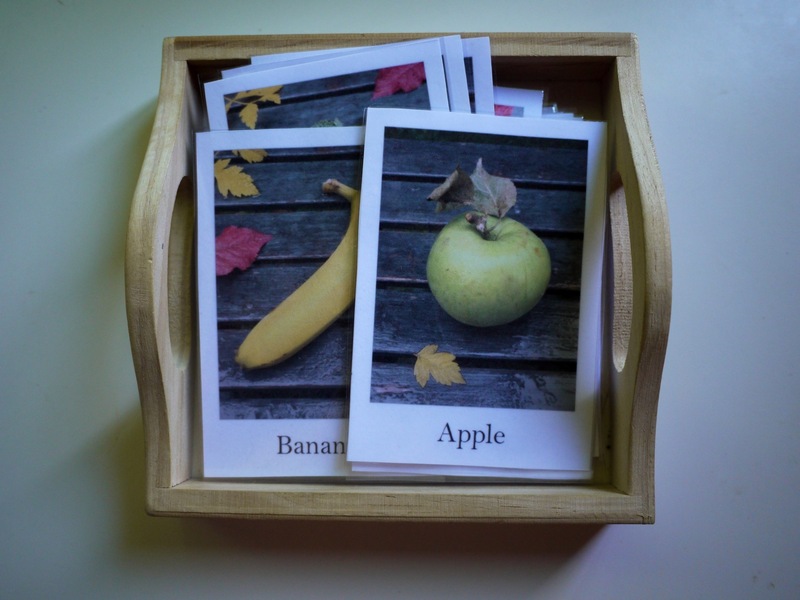 Today I made Quentin some fruits and vegetable cards for matching. After lusting after the ones on Michael Olaf I decided that I would search and see if I couldn’t find an alternative. These are from Mr. Printables. The are beautiful, show a real image and of course are free of charge. I printed off 2 sets and then laminated them for better durability. I presented them to Quentin by picking 3 cards and laying them down neatly left to right. I then picked up each card and slowly said the name of the image pictured. When I had presented all 3 cards I asked him for a specific one (ex. Where is the banana?). 3rd period lesson anyone? He got it right away. On a side note he clearly is ready for a work mat. If anyone has a suggestion or recommendation, it would be welcomed. 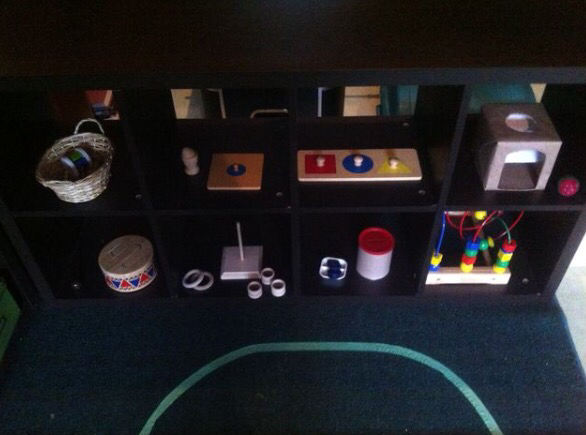 I suppose the difference in our Montessori home is that not every room is set up in a Montessori way. We have a big house. I need part of it to be just for me. 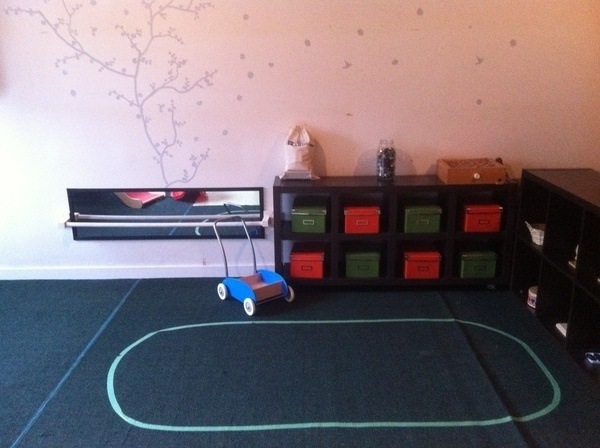 So although the boys have access to and are welcome in the living room there are no materials here. Instead they have their own space. A space entirely dedicated to them and them using materials at their own pace. Their bedrooms, the bathroom and the kitchen all have Practical Life and/or Care of Self aspects in them as well, (that’s another post) so I don’t feel too guilty when I say the living room is just for me. This is how the space began. Quentin was 4 months old. It has concrete floors so it needed carpet. 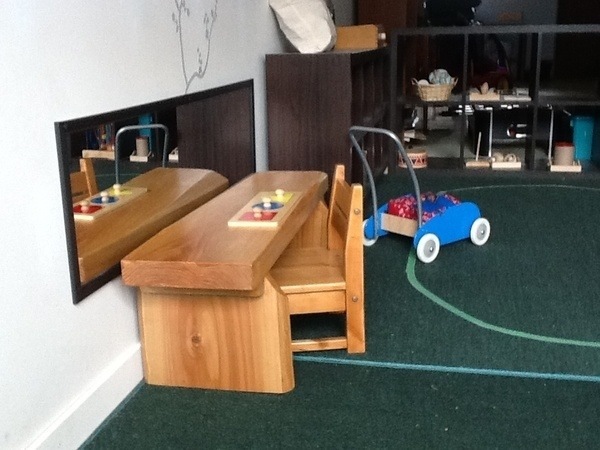 The wall mirror and movement mat were where we hung the Montessori Mobiles. But the shelf didn’t have a natural flow. It got better. Quentin got older. 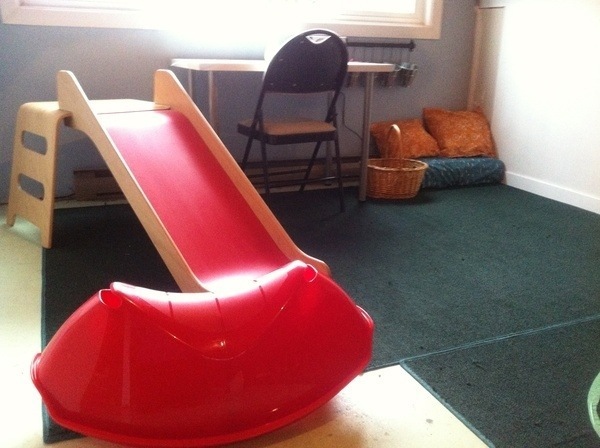 This was the space when Quentin was 9 months. The movement mat was gone and so were the mobiles. The all important mirror remained with the new addition of a pull up bar. 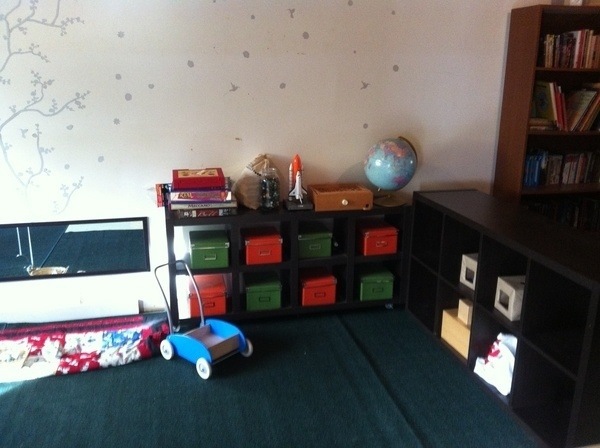 Quentin’s gross movement area and a reading corner at both boys could easily access. At 11 months this is the space now. The pull up bar is gone. 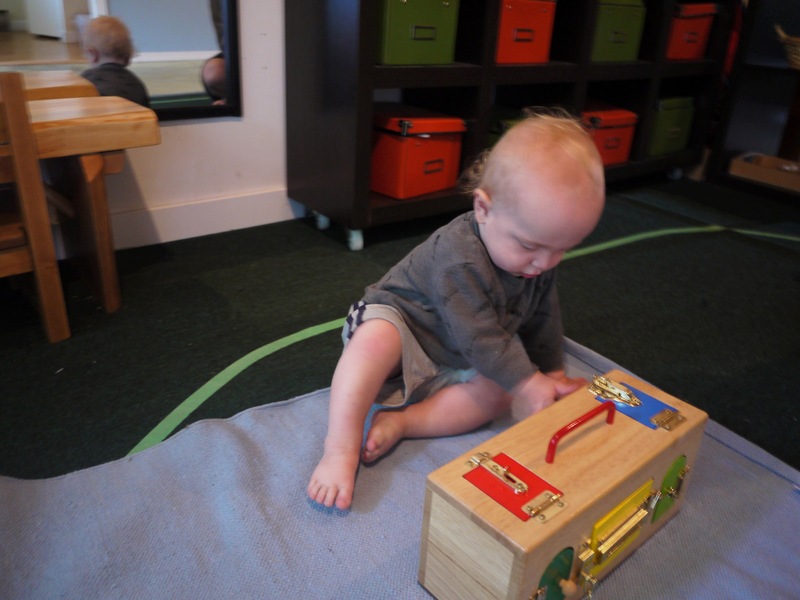 A work table that Quentin can independently get up from is key in an infant Montessori space. 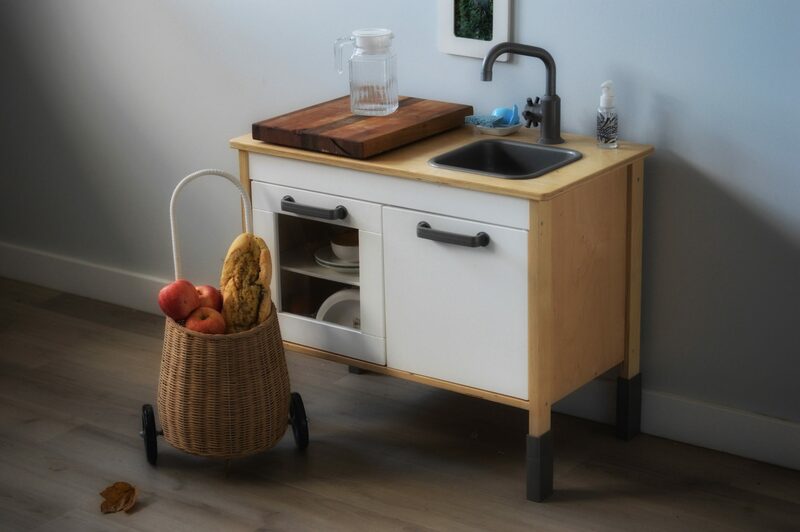 There are many on the market, but we were lucky enough to have one made out of locally logged cedar by a friend. So that’s where we are. It’s not perfect, but the boys enjoy it. The big window above Anthony’s work table lets in a huge amount of light and there is a large maple tree right outside where we watch the birds come and go from the feeder. 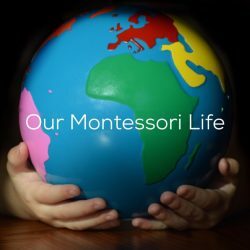 As with all Montessori environments, it will continue to evolve to meet their ever changing needs.